Just last week, Lenovo announced a substantial overhaul of most of it’s ThinkPad lineup. One of the main new features were a new silver color, along with USB-C and Thunderbolt 3 on many models. Today, the X1 family gets the same treatment, with the X1 Carbon, X1 Yoga, and X1 Tablet all offering new features. The X1 Carbon is now on its fifth generation, and while all generations have brought about a slimming and reduction in weight, it is this new fifth generation X1 Carbon that will be the most exciting since the original’s introduction. The X1 Carbon has always been a 14-inch notebook, starting with the first generation 1600x900 model, and up to the more recent editions which could be had with a 2560x1440 display like the 2015 model we reviewed. The 2017 offering keeps the 14-inch panel in 1920x1080 IPS or 2560x1440 IPS options, but stuffs that same panel into a much smaller laptop. The X1 Carbon has gone thin bezel, which means it’s a 14-inch notebook in the same physical space as a typical 13.3-inch model. 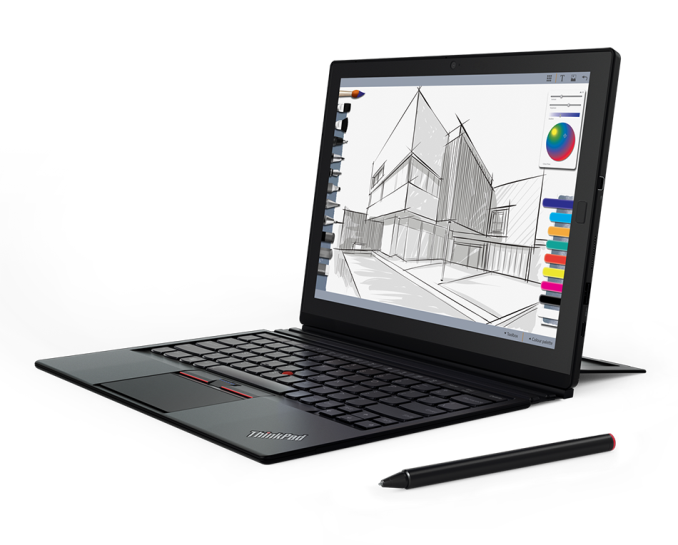 In addition, the new X1 Carbon can now be had in the traditional ThinkPad black, or the new Silver option. The X1 Carbon also jumps on the Thunderbolt 3 train, with two USB Type-C ports both offering the high speed protocol. It also lets users continue to use their existing devices with two more USB 3.0 ports, as well as HDMI, native RJ45 (with a dongle, but not USB based), micro SD, and even a micro SIM with Qualcomm Snapdragon X7 LTE-A cellular connectivity. For more traditional wireless, Lenovo offers the Intel Dual-Band Wireless-AC 8265, which is a new take on the already excellent 8260 model that now offers MU-MIMO support. There is also an option for the Intel Tri-Band Wireless-AC 18265, which adds WiGig support on top of the normal 8265 card. WiGig allows wireless docking solutions. 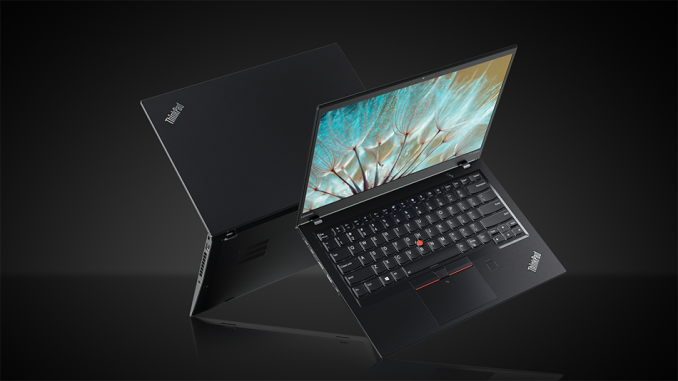 The X1 Carbon’s main selling point is that it is a traditional clamshell notebook, and Lenovo removed the touch option last year, putting touch on the X1 Yoga, but the X1 Carbon tips the scale at only 2.49 lbs, or 1.12 kg, making it the lightest X1 Carbon yet. Unlike the Dell XPS 13, which can be credited as being the first thin bezel notebook, Lenovo has added a bit of bezel to the top of the device to fit the webcam, which should make it a lot more usable to those that require a webcam. And they’ve even found enough space to add a second IR camera for Windows Hello facial recognition. Arguably one of the biggest issues with the X1 Carbon has been the mediocre battery life, but with the 2017 model, Lenovo is now claiming up to 15.5 hours of battery life on MobileMark 2014. The Broadwell based X1 Carbon was the last that we reviewed, and it did not even manage eight hours of battery life on our light test, so hopefully we can test the new model and see the difference. It’s great to see Lenovo focus on battery life, which was really the one pain point with the previous models. The X1 Yoga gets its first product refresh since it was introduced last year. The changes on the X1 Yoga are not as significant as the X1 Carbon, but there are still a few nice new features to discuss. The X1 Yoga will now be available with an Intel Iris Plus Graphics 640 GPU, in addition to the base Intel HD Graphics 620, and the Iris model will feature up to 16 GB of 2133 MHz LPDDR3, up from the 1866 MHz LPDDR3 on the 620 model. The faster memory with the Iris GPU and eDRAM should help overall performance for all tasks. The X1 Yoga also adds USB-C with Thunderbolt 3, and offers two ports like the X1 Carbon. It also offers three USB 3.0 ports, HDMI, native RJ45 (with a dongle), micro SD, and a micro SIM with the same Qualcomm Snapdragon X7 LTE-A cellular connectivity as the X1 Carbon, and it offers the same Intel 8265 or Intel 18265 WiFi options, with the latter supporting WiGig for wireless docking. The display options remain the same as the previous model, with both two IPS panels, at 1920x1080 and 2560x1440, or the OLED version is back as well, at 2560x1440. 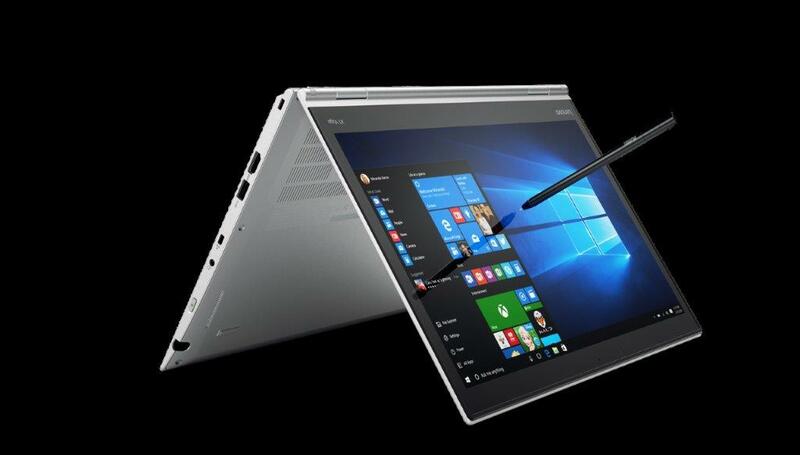 Lenovo rates the X1 Yoga at up to 16 hours of battery life with the IPS panel, or 10.5 hours with the OLED version. There is also an optional IR camera for Windows Hello login. Lenovo has updated the keyboard, which had a retractable cage around it to lock the keys in place when the screen was flipped around. The X1 Yoga now retracts fully flat for better stability and comfort, and Lenovo claims anchoring the keys gives better durability. 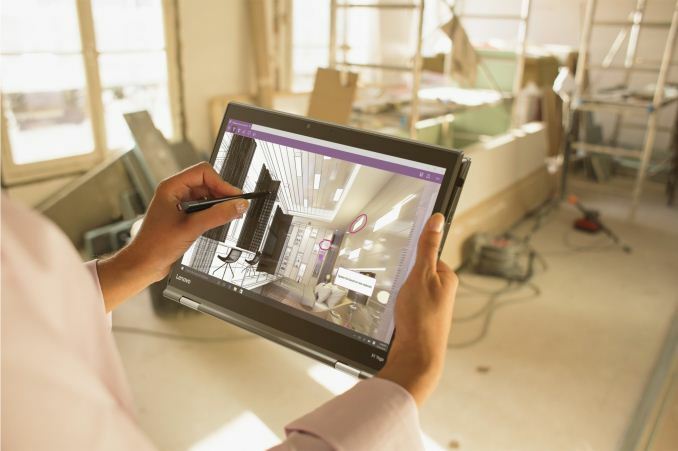 There is also a new ThinkPad Pen Pro with a new soft elastomer tip, to give more friction on the display and provide a more natural writing experience. The X1 Yoga continues to be a thin and portable 2-in-1, with the LCD model weighing 3.13 lbs / 1.42 kg, and the OLED version is a bit lighter at 2.99 lbs / 1.36 kg. Also announced last year at CES, and seeing its first refresh, is the X1 Tablet. 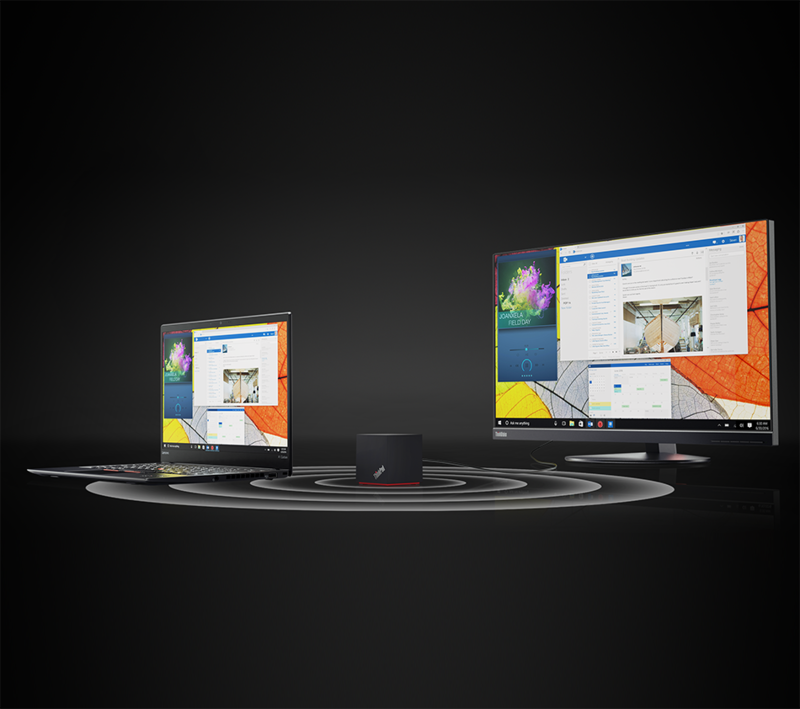 Like the X1 Yoga, it offers only a few changes, including Kaby Lake Y series processors, up to 1 TB SSD capacity, and battery life up to 10 hours without the 5 hours with the Productivity module. It also features a USB-C port with USB Power Delivery, but no Thunderbolt 3. There is another USB 3.0 port as well, along with a mini DisplayPort, micro SD, and nano SIM slot for the Qualcomm X7 LTE-A, or Sierra Wireless AirPrime EM7430 cellular options. For WiFi, it keeps the same options as the rest of the X1 lineup with either an Intel 8265 or 18265 solution. While the X1 Yoga and X1 Tablet only got minor refreshes, they were also products announced just a year ago. 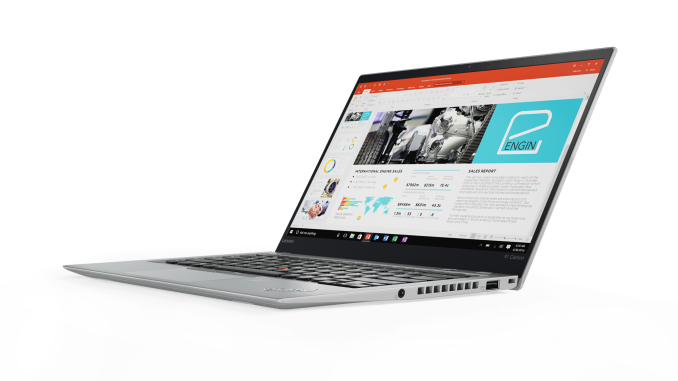 The X1 Carbon has received a significant update for 2017, with a sleeker, lighter design, a thin bezel display, and improved battery life. We should have some hands-on time with the new devices this week at CES. Never assume anything will ever get the Intel Iris GPU option again... ever! Something I really appreciate: Lenovo now lists if the SSD you're buying is TLC (instead of some no-name "guess").